On June 26th of last year, members of the Neo-Nazi gang the Golden State Skinheads (GSS) and the Traditionalist Worker Party (TWP) stormed the California State Capital grounds after an overwhelming turnout of antifascist protesters cancelled their rally. The Neo-Nazis came armed with bats, shields, knives, and guns, and sent 9 individuals to the hospital, many of whom sustained critical injuries and stab wounds. Of the twenty Neo-Nazis present that day, one, William Scott Planer, is currently facing charges. Sacramento County Jail booked Planer on September 9th after being extradited from the El Paso County Jail in Colorado Springs, where he’d been held since July 14th of this year. He was originally arrested and charged with vandalizing the Chabad Lubavitch of Southern Colorado after being caught on camera affixing a sticker to the door of the synagogue that read “fight terror, nuke Israel” late one night. El Paso Country Jail held him for nearly two months on $500,000 bail and a “fugitive from justice” hold. The hold as a result of a warrant due for his arrest out of Sacramento, where he’s charged with felony assault with a deadly weapon and misdemeanor riot for the attacks he participated in on June 26th. The vandalism case in Colorado is now behind him, and the case here in Sacramento is underway. Planer is affiliated with both the Golden State Skinheads (GSS) and the Traditionalist Worker Party (TWP). As a highly active and well connected member of the White Nationalist movement, the Nazis did not forget him after his arrest in Colorado and subsequent incarceration. Soon after his arrest, the leaders of TWP, Matthew Heimbach and Matt Parrot, launched a crowd funding campaign to raise money for his bail and legal defense using the now-defunct crowdfunding platform Rootbocks.com, a website commonly used by white supremacists and Neo-Nazis due to its anti-censorship mission. Rootbocks’ web host shut down the site on August 14th and cut off by its payment service, and despite attempts to find a new web host, it remains offline. It is unclear if those doing Planer’s support work ever obtained the the money raised by the campaign, but the fundraiser page itself no longer exists. However, while Planer’s defense fund was still up, almost $15,000 was raised. 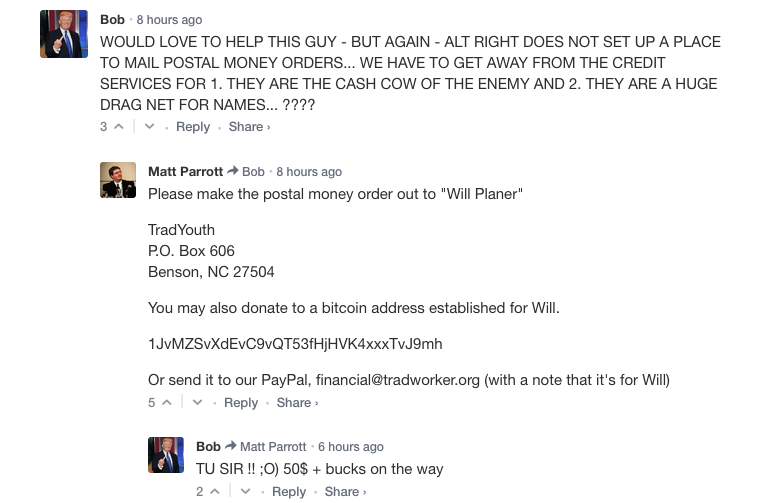 The money came from supporters from all over the world, many of whom left comments about their support for and commitment to the white nationalist cause on the fundraiser page after donating. As well as being the leader of TWP, Matt Parrot is also one of the founders of the Traditionalist Youth Network (TYN), a group that promotes white supremacy. Here’s a screenshot of three of the donations to the online William Planer defense fund. If you notice in the top comment the number 88 is a popular number among white nationalists because H is the eighth letter of the alphabet, so the 88 ends up standing for “Heil Hitler”. Upon arriving at the Sacramento County Jail, William Planer’s bail was raised to $600,000. As a twice-convicted felon looking at his third strike if convicted in his current case, it’s clear he’s going to need a good lawyer. So, the local members of GSS, the leaders of TWP, and the white nationalist movement as a whole, managed to hire long standing Sacramento lawyer Danny D. Brace to represent William Planer. As stated on his website, bracelaw.com, the law firm that Danny Brace practices out of which has been in the same location since 1984. It takes a certain kind of person to willingly represent a Neo-Nazi who participated in assaults and stabbings of anti-racist protesters, but given Brace’s track record, no one should be surprised. Affectionately referred to as “Dump Truck Dan” by past clients burned by his poor performance, Danny Brace has a history of working for those who commit racist violence. As recently as three years ago he represented Joseph Paul Leonard, a man tried for committing the racially motivated murder of Toussaint Harrison and the attempted murder of Toussaint’s friend, Justin Oliphant. After just two days of deliberation, the jury convicted Leonard of both first degree murder and attempted murder, both with a hate crime enhancement, and sentenced to 32 to life. Now, Brace is solidifying his reputation as defender of racist scum by representing a violent Neo-Nazi. It is unacceptable that Brace is accepting the money of Neo-Nazis and White Nationalists in exchange for defending a known white supremacist, especially one who has attacked anti-racist protesters and sent them to the hospital. These actions cannot go unopposed. Help us spread the word about Brace, who he is funded by, and the kinds of people he likes to defend- you can leave reviews of Danny Brace and Brace Law on Yelp, Google, and Yellow Pages. 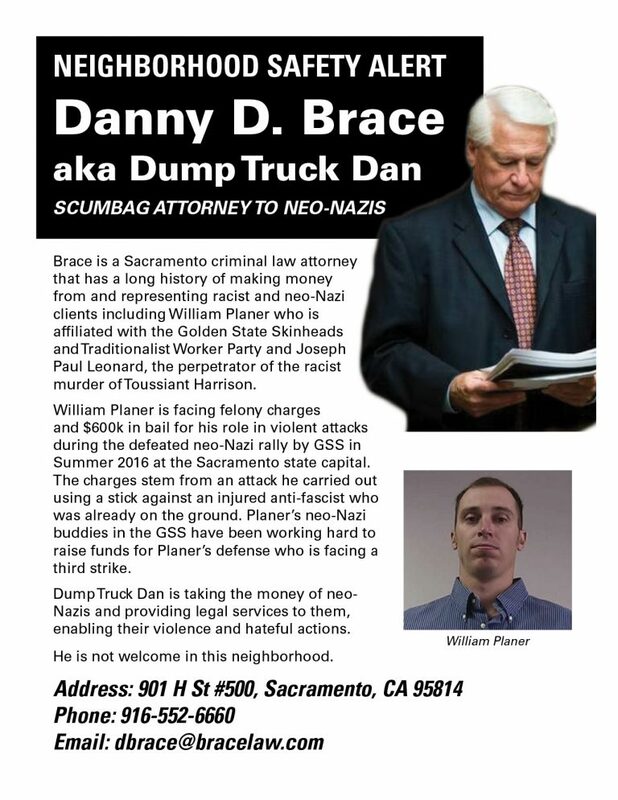 His law firm is located at 901 H St, suite 500, Sacramento CA, 95814, the office phone number is (916) 447-0592, and Danny Brace’s email is [email protected] Feel free to get in touch with him and let him know how you feel about him accepting the money of white supremacists and defending a violent Neo-Nazi. The wounding of 9 anti-racist protesters on June 26th of 2016 did not happen in a vacuum. The actions that William Planer participated in and that Danny Brace is defending are part of a broader fascist movement being pushed forward by white supremacist groups in the United States. The stabbings by members of the Golden State Skinheads are directly connected to the violence that took place in Charlottesville, Virginia when a white supremacist ran his vehicle into a crowd of anti-racist protesters, killing the protestor Heather Heyer, and injuring many more. They are directly connected to the hate crimes, shootings, murders, and attempted murders that are cropping up all over the nation. They are affiliated with a White Nationalist movement that puts immigrants, protesters, and black, brown, and queer communities under threat of violence. More than that, their actions are rooted in the history of white supremacy that stains the soil of this stolen land. We cannot expect the state to protect us from this threat, not when the state itself is one of the greatest enforcers and producers of the racist social order. William Planer sits in a jail cell because the state seeks to maintain a monopoly on violence, not because his actions go against its principles. We must look to each other and fight back, nationally and locally. White supremacists and those who would defend them must be opposed and disrupted at every stage of their organizing, by any means available.